Former Indian captain Mohammed Azharuddin today lashed out at Vinod Kambli for hinting that India's 1996 World Cup semi-final match could have been fixed. A file photo of the 1996 World Cup semifinal shows Sachin Tendulkar (L) being stumped by Sri Lankan wicketkeeper Romesh Kaluwitharna. Hockey India (HI) has taken a firm foot hold of the administration of the game in the country after the International Hockey Federation (FIH) recognized it as the sole custodians of hockey during its Executive Board meeting at Lausanne (Switzerland) on November 14. HI announced here today that India will participate in the Champions Challenge Trophy Tournament in South Africa from November 26 to December 4. 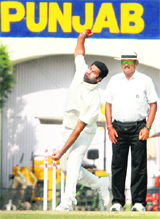 Jaidev Unadkat bowled a lethal opening spell to reduce Punjab to 59 for 3 at Stumps on Day 2 of their Ranji trophy match at the PCA Stadium in Mohali on Friday. Sandeep Sharma was unbeaten on four, as Punjab trail Saurashtra by 487 runs and seven wickets in hand. India’s men team entered the final of gthe ongoing second Kabaddi World Cup after beating Italy (74-15) in the first match at Bathinda stadium tonight. Indian players did not allow the Italians any room for comfort and managed to score 17 points without giving the Italians a chance to open their account. As many as eight more players have tested positive in the dope test results declared by NADA today. With this, the total count of the dope-tainted players has now reached 42 and all of them have been provisionally suspended from the Cup. South Africa battled back in another topsy-turvy Test against Australia to take four wickets after lunch and slow the tourists' progress after their imposing 174-run opening stand at Wanderers here today. Pakistan could not make good of a flying start provided by their openers, and ended with a rather ordinary score of 257 for 8 against Sri Lanka here tonight. Batting first, Pakistan openers Imran Farhat and Mohammed Hafeez started cautiously and were involved in a 151-run stand, but the rest of the batting could not follow their lead, leaving them short of what should have been a massive score. Embattled FIFA president Sepp Blatter apologised for his controversial comments about racism on Friday but said he would not be resigning despite a growing clamour in Britain for him to step down. "It hurts and I am still hurting because I couldn't envisage such a reaction," the 75-year-old head of world soccer's governing body said in a BBC interview. 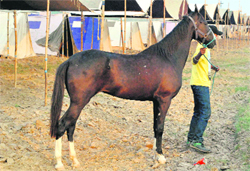 After the success of the first ever 30km All-India Horse Endurance in Punjab, horse breeders and riders have started arriving at Kaler Bhaini village in Patiala district today along with their horses to take part in the 2nd All-India Horse Endurance. Saina Nehwal bowed out of the Hong Kong Open badminton after losing to Denmark's Tine Baun 16-21, 15-21 in the women's singles quarterfinals here today. Bahrain : Soumyajit Ghosh, Sourav Saha and Harmeet Desai won their respective first-round boys' singles matches while Ankita Das defeated her Egyptian rival to move into the second round of the Volkswagen World Junior Table Tennis Championships here. Former Indian captain Mohammed Azharuddin today lashed out at Vinod Kambli for hinting that India's 1996 World Cup semi-final match could have been fixed, saying the allegations have been made by a person who lacks character and were "absolutely rubbish". "Absolutely rubbish, whatever he (Kambli) is talking. He doesn't know what he is talking, when you have people who have no character and no background come on TV and talk absolute rubbish in front of the nation and demeaning all the players who played in the team, it is totally disrespectful and its very sad," a livid Azhar told reporters. Azhar, who was the Indian captain at that time, said the decision to field first was a collective decision. "May be when he was sitting in the meeting, he must have been sleeping," he added. Kambli, a former Indian cricketer who has often been embroiled in controversies both on and off the field, yesterday raised suspicion on the 1996 World Cup semi-final between India and Sri Lanka and said he found "something amiss" in the game. "I will never forget the 1996 match because my career ended after this and I was dropped from the team. I was stunned by India's decision to field," Kambli had said. Azhar, however, refuted all the allegations leveled against him saying it was a team decision to field after winning the toss. "It was a team decision which was taken by all the team members that when we win the toss we will field. Whatever he is talking is absolutely rubbish and nonsense". 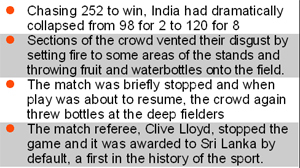 Wadekar, however, said that electing to field first was a collective decision as the team felt that Sri Lankan's were good chasers. "In the team meeting before the match it was decided that India would field in the event of winning the toss. The decision was taken after consultation with the entire team," Wadekar said. India were given a slot in the Champions Challenge after the FIH shifted the Champions Trophy from New Delhi to Auckland (New Zealand) as a reprisal when the Sports Ministry played the role of a mediator to bring together HI and the Indian Hockey Federation (IHF) to forge a working relationship. The FIH stuck to the stand of one federation for one sport to be in tune with the International Olympic Committee (IOC) Charter. India have been drawn in Pool A of the Champions Challenge, along with Belgium, Poland and hosts South Africa. Pool B consists of Canada, Argentina, Malaysia and Japan. Hockey India has retained custodian Bharat Chetri as the captain, with Tushar Khandker as his deputy. They have a combined experience of 318 international matches, including Chetri’s 116 caps. India will meet Belgium in the opening match on November 26, followed by matches against South Africa (Nov 27) and Poland (Nov 29). HI, at its second Annual General Meeting held here, named former Indian captain Ajitpal Singh as the chairman of the Coaching and Development Committee. Ajitpal has the historic feat of leading India to their only World Cup victory in 1975 at Kuala Lumpur, and represented the country in three Olympic Games, World Cups and Asian Games from 1968 to 1976. He had earlier headed the senior selection committee. Meanwhile, Ten Sports has entered into a long-term partnership with the FIH to acquire the broadcasting/telecasting rights for the major FIH-sanctioned events till 2014. FIH president Leandro Negre said, “We are delighted to extend our long-term partnership with Ten Sports for a further four years. This deal is of unprecedented value to the FIH, not only in terms of the record license fee, but also for us to guarantee hockey fans and FIH sponsors unparalleled exposure for the world's best hockey events”. Thus, Ten Sports will be telecasting the following tournaments: Champions Challenge, South Africa (Nov-Dec 2011), Champions Trophy (New Zealand, December 2011), Olympic qualifiers (Delhi, February 2012), Champions Trophy (Australia, Dec 2012), World League semis (Germany, June 2013), Junior World Cup for men (India, Nov 2013), World League finals (India, December 2013), Champions Trophy (Argentina, 2013) and World Cup (Netherlands-Hague, June 2014). Follwing is the Indian team for the Champions Challenge in SA: Bharat Kumar Chetri and P.R. Sreejesh (goalkeepers), Manjeet Kullu, Rupinder Pal Singh, V.R. Raghunath, Sandeep Singh, Gurbaj Singh, Sardar Singh, Arjun Halappa, Manpreet Singh, Birender Lakra, Sarvanjit Singh, Yuvraj Walmiki, S.V. Sunil, Danish Mujtaba, Tushar Khandker, Chinglensana Singh Kangujam and Shivendra Singh. Chief coach: Michael Jack Nobbs; coaches: Mohd. Riaz and B.J.Kariappa. Meanwhile, HI has stuck to its stated stand that those players, who would be attending the national camps, would not be released for the World Series Hockey (WSH), to be held from December 17, though most of the top Indian players have been contracted by WSH for playing in the league. Earlier, Saurashtra kept up their incredible batting prowess and amassed 542 runs before being all out. Shitanshu Kotak was the star of Day 2 as he scored an unbeaten 166 to help his team in keeping Punjab firmly in their grip. Kotak was in his element through the day and tortured the Punjab bowling and fielding alike, as he hit 21 boundaries in his 295-ball innings. For Punjab, there was to be no respite through the day and even Manpreet Gony’s six-wicket haul (6-143), was not good enough to bring any sort of cheer to them. Kotak was ably supported by some resilient batting from Jaydesh Odedra who scored 121-ball 53. Punjab skipper Harbhajan Singh’s misery didn’t look like ending as he himself was not able to inspire his team’s bowling into pulling the game back. The Turbanator, who is struggling to find his rhythm, just as he is struggling to find a way back into the Indian side, picked up only one wicket. 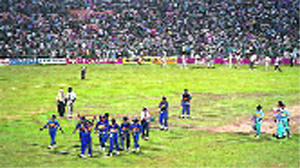 The Indian raiders took a considerable lead, which they kept expanding till the completion of the match. While India got 74 points, Italian players managed to score a mere 15 points. The robust Indian team members enthralled the audience by carrying Italian players twice on their shoulders amidst cheers and applause. Earlier, India won the toss and team captain Sukhbir Sarana opened the account for his team by getting a point from his very first raid. The captain continued picking up the points and adding to the misery for his rivals. Indian raiders including Sandeep Dirba scored 11, Gagandeep Khiranwali 10, captain Sukhbir Singh Sarawan 8, whereas, Indian stoppers Ekam Hathoor scored 9, Mangat Singh Mangi 6 and Gurwinder Kahlwan 6 points, helping India prove their supremacy over Italy. Till half time the score was in favour of India (33-4). Audience kept cheering for the Indian players who managed to get 49 points around 25 minutes before the completion of match. In the Italy team raider Dharminder Singh Bhindi scored 7 points and Baljinder Khiranwali scored 6 points. The single stop by Major Dhandowal on Sukhbir Sarawan was the only saving grace for Italy. The second match between India and US women’s teams remained the most engrossing match of the day. India beat US (57-7) and entered in the finals. Just like the first match of the day, Indian players dominated the US from the word go. As many as eight more players have tested positive in the dope test results declared by NADA today. With this, the total count of the dope-tainted players has now reached 42 and all of them have been provisionally suspended from the Cup. As per the latest report, the number of dope-positive players for England and Spain is 8 and 7, respectively, and therefore they have been suspended from the tournament because of shortage of players. Though these teams did not make it to the semifinal and were already not playing future matches but they have been suspended in the wake of large number of dope-positive players. Talking to The Tribune in this regard, Director General of NADA Rahul Bhatnagar informed that out of these 42 players, 8 are from England, 7 from Spain, 6 from Australia, 6 from Canada, 5 from Italy, 4 from USA, 3 from Norway and one each from India, Germany and Argentina,” he added. When questioned as to what would be the future course of action of NADA during the semifinal and final matches of the Cup, Bhatnagar informed that they would continue to take samples and would declare the reports within a day to ensure that guilty players do not get away. “We will collect the samples of all players who have not been tested earlier and in case we are suspicious about any player who has been tested before, we might again collect his samples for re-testing” he added. Meanwhile, after one of the players and an official of the participating team had allegedly threatened the dope coordination committee official of NADA of dire consequences, the dope officials have been provided four security guards. Australia were 220-4 at tea, adding just 51 runs for the loss of four wickets in the second session after hammering 169 for no wicket before lunch. Openers Shane Watson and Phil Hughes, who both scored 88, dominated the morning as they hammered South Africa's bowling to all parts in Johannesburg in their 169-run stand before lunch. But Vernon Philander broke through with the wicket of Hughes soon after lunch and South Africa dragged Australia back from 174-0 to 220-4. Australia were still only 46 runs off South Africa's 266 with six wickets in hand and in a strong position to take a first-innings lead in a match it has to win to save the two-Test series. Australia trail 1-0 after their eight-wicket defeat in Cape Town, another rollercoaster game between the teams that ended inside three days. The second Test looks to be moving on rapidly, too. Hughes hit 14 fours in his 111-ball knock, sending Australia to an initially very strong position alongside opening partner Watson. The left-hander fell soon after lunch, however, ending the imposing stand when he tried to cut too close to his body and sent an edge off Philander to AB de Villiers at slip. Earlier, Pakistan were 150 for 0 in 29 overs, but the pitch was not flat, and run-making wasn't easy. They then lost 5 for 43 in the next 10 overs, but the wicket hadn't suddenly started playing tricks. The truth lay somewhere in between: Imran Farhat and Mohammad Hafeez were tested on a strip hosting its third game in eight days, but were helped by a tame bowling effort. Sri Lanka's spinners, led by the leggie Seekkuge Prasanna, hit back in the middle overs, but were aided by a raft of poor strokes. After lurching unpredictably through the bulk of the innings, both sides were relegated to guarding their positions in the end overs, leaving Sri Lanka chasing 258 for a 2-1 lead. "When you have done something that was not totally correct, I can only say I am sorry for all those people affected by my declarations." Blatter sparked outrage, most notably in England where the FA is dealing with two high-profile racism allegations, when he suggested on Wednesday that incidents of racist abuse on the pitch should be settled with a handshake after the game. Blatter said he would not quit over the remarks that have provoked back page headlines in Britain's newspapers such as "Go Now Blatter" and "Now He Must Go". After the success of the first ever 30km All-India Horse Endurance in Punjab, horse breeders and riders have started arriving at Kaler Bhaini village in Patiala district today along with their horses to take part in the 2nd All-India Horse Endurance. An initiative of the Horse Sports and Breeders Society of Punjab, this time it will be a 40km endurance run that will be divided into two rounds of 20km each. Gagandeep Ahuja, Vice president (media) informed that for a rider to be eligible to participate, he should be able to qualify the 40km ride. “We are hoping that such an endeavor will introduce to the new generation the skills associated with horsemanship and acquaint them to the modern day equestrian sports, thus preparing them to eventually compete at the national and international levels. Subedar Sher Singh from Doaba Public Senior Secondary School, Garhshankar, said, “I teach horse riding in the school and have come here along with five students who would be riding the horses during the competition. Its a good opportunity for kids take it up as a profession,” added Singh.